The first renderings, which show optimum use of the aircraft’s spacious and cutting edge cabin, will be available for viewing at Acropolis’ Booth No I089 during EBACE this week (24th -26th May). “We are delighted to have been chosen by Acropolis to work on their new ACJ320neo and have the opportunity to create something really exceptional,” said Mrs Linda Pinto. 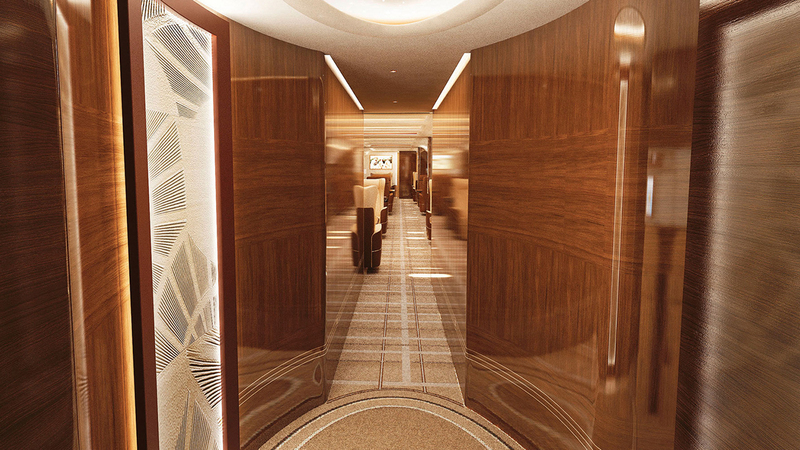 Acropolis’ current ACJ319, which entered service in 2010, has become a showcase for Alberto Pinto’s creative talents in aircraft interior design. The new project will be the responsibility of Pinto’s Yves Pickardt who also styled G-NOAH previously. Acropolis’ new aircraft will have 19 seats, a private master bedroom with luxury en-suite, and a larger galley fitted out like a real kitchen to cater for its clients’ wishes. “We continue to receive positive feedback from clients flying G-NOAH. The care and attention taken on designing this exceptional and ergonomic cabin means it is as stylish today as it was in 2010 and this is the reason we reengaged Alberto Pinto Design,” said Jonathan. Together the companies will now meet with cabin outfitters and evaluate which will be engaged to make the design a reality.